↑ Jason Toynbee (8 May 2013). Bob Marley: Herald of a Postcolonial World. John Wiley & Sons. pp. 1969–. ISBN 978-0-7456-5737-0. สืบค้นเมื่อ 23 August 2013. ↑ Lou Gooden (2003). Reggae Heritage: Jamaica's Music History, Culture & Politic. AuthorHouse. pp. 293–. ISBN 978-1-4107-8062-1. สืบค้นเมื่อ 25 August 2013. ↑ Aston "Family Man" Barrett Interview at Pure Guitar. Interviewer: Jas Obrecht. Published 19 February 2013. Retrieved 23 August 2013. ↑ Ayodele, Olusola Olujide (11 May 2013). "32 Years After, The 'Legend' Bob Marley Lives On". Leadership (Nigeria). สืบค้นเมื่อ 26 January 2014. ↑ Nielsen Business Media, Inc. (6 October 2007). Billboard. Nielsen Business Media, Inc. pp. 42–. ISSN 00062510. สืบค้นเมื่อ 23 August 2013. ↑ Jon Masouri. Wailing Blues - The Story of Bob Marley's Wailers. Music Sales Group. pp. 242–. ISBN 978-0-85712-035-9. สืบค้นเมื่อ 7 September 2013. ↑ David Vlado Moskowitz (2007). Bob Marley: A Biography. Greenwood Publishing Group. pp. 13–. ISBN 978-0-313-33879-3. สืบค้นเมื่อ 10 September 2013. 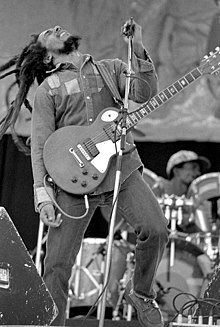 ↑ Stephen Davis, as early as 1983, wrote that "his name was changed from Nesta Robert to Robert Nesta Marley, at the suggestion of the passport clerk, who thought Nesta sounded like a girl's name." ↑ Bob Marley (31 January 2012). Listen to Bob Marley: The Man, the Music, the Revolution. Open Road Media. pp. 65–. ISBN 978-1-4532-2494-6. สืบค้นเมื่อ 1 September 2013. ↑ The Last Wailer - Bunny Wailer interview at GQ. Interviewer: John Jeremiah Sullivan. Published January 2011. Retrieved 22 October 2013. หน้านี้แก้ไขล่าสุดเมื่อวันที่ 16 ธันวาคม 2561 เวลา 18:02 น.